At Six Seconds, we’re big on connecting. Of course, we love to connect thinking and feeling, and we encourage connections at many other levels as well. We connect people around the world who are passionate about EQ. We also connect people who are certified in our tools with people seeking to make themselves or their organizations better. So, I thought it would be appropriate to try and connect two sides of my life. I spend a lot of time talking to people about the Six Seconds Vital Signs Toolkit, our integrated suite of organizational assessment tools. Vital Signs offers powerful assessments at the leadership, team, and organizational levels designed to measure and improve key performance drivers. I also spend a lot of time on my doctoral dissertation and I have just completed a series of interviews with people at organizations striving to embrace a culture of sustainability. Perhaps not surprisingly, one of the key themes that emerged was that Relationships Matter. The surprise, perhaps, is that relationships matter in so many different ways. From melting traditional hierarchical and departmental boundaries, to fostering equitable partnerships across the supply chain, to connecting with stakeholders, including customers and fans, on shared social values, to working like family, feeling authentic, and fitting in at the company – at the end of the day, without this web of relationship, sustainability efforts fail. When we look at the Vital Signs model, all of the elements are connected by relationships, with trust at the center. 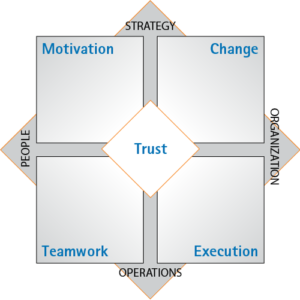 The two axes of people-organization and operations-strategy interact with the key drivers of organizational effectiveness in the four corners of the model: execution, teamwork, motivation, and change. At each juncture, relationships matter, which is why at Six Seconds we talk about the people-side of performance. In combination, we have motivated people working together to execute effectively and produce positive change for the organization. The result is a climate of high engagement driven by trusting relationships. Many companies try to pursue execution, teamwork, motivation, and change without paying attention to human relationships, but the results are not sustainable. That is where the power of the Vital Signs model rests, in the lasting effects of a transformed organizational climate in which relationships matter. If you would like to discuss Vital Signs and making the relationships in your company more sustainable, please contact Paul Stillman at [email protected]. That, as they say, is the $64K question. The definition of trust in our Vital Signs leadership model is, “Trust is a feeling of confidence, faith, and surety – a trustworthy leader is someone who others will rely upon.” I think trust emerges from the leader’s self awareness of his or her own authenticity and commitment to transparency, and from the alignment of word and deed, a track record of delivering on promises, soliciting and acting upon feedback, and acknowledging the feelings that surround trusting relationships. Very good article – yes, for solid relationships you must have trust.